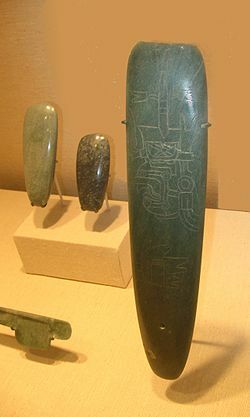 In archaeology, a celt /ˈsɛlt/ is a long, thin, prehistoric, stone or bronze tool similar to an adze, a hoe or axe-like tool. The term "celt" came about from what was very probably a copyist's error in many medieval manuscript copies of Job 19:24 in the Latin Vulgate Bible, which became enshrined in the authoritative Sixto-Clementine printed edition of 1592; however the Codex Amiatinus, for example, does not contain the mistake. While this is now considered to be the case by most scholars, some are still prepared to consider the existence of a real Latin word. A "celt" was thus wrongly assumed to be a type of ancient chisel. 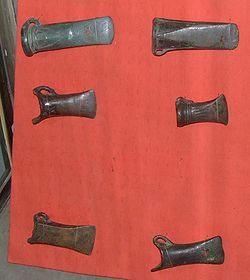 Early eighteenth century antiquarians, such as Lorenz Beger, then adopted the word for the stone and bronze tools they were finding at prehistoric sites; the OED suggests that the imaginary etymological connection with the Celts may have assisted its passage into common use. A shoe-last celt was a polished stone tool used during the early European Neolithic for felling trees and woodworking. ^ Laistner, M. L. W. (1 January 1925). "Floscvli Philoxenei [Flosculi Philoxenei]". The Classical Quarterly. 19 (3/4): 192–195. doi:10.1017/S0009838800015846. JSTOR 636281. ^ ""Match 2" here". Archived from the original on 2011-07-17. "Celt, a word in common use among British and French archaeologists to describe the hatchets, adzes or chisels of chipped or shaped stone used by primitive man" . Encyclopædia Britannica (11th ed.). 1911.